Most people know what to expect from a limousine rental. They expect a machine that’s become synonymous with luxury and style. They expect great service and a lot of creature comforts built into the car itself. They also expect a chauffeur to come with the vehicle. However, in a limo hire Perth situation, just what can you expect from the man driving the car? It’s usually an afterthought for most people, but not for others. With that in mind, just what can you expect from the chauffeur that comes with the limousine? First, the average chauffer is a professional. They make their living driving these luxury vehicles around and aren’t just pulled off the street. There’s no strict educational requirement, beyond what one needs to attain a professional driver’s license. Companies might offer specialized training courses that you are required to complete before you can take the wheel, though. More important than educational attainment, though, is having a spotless driving record. A driver must pass a very strict background check, with a great deal of scrutiny directed at their record. They must not be involved in any major accidents and maintain a safe driving record during their employment. All licenses must be updated as well. As part of the standard background check, criminal records are also checked. A reasonably clean record is sufficient, with no outstanding offences or major crimes. Limo drivers are taught to be a service-focused bunch. They must communicate with the passenger for directions, plans, and timetables. They are required to be courteous, such as opening and closing the door for their clients. They also offer physical assistance to clients with disabilities or the elderly. Drivers that dislike being a part of the service industry don’t last very long as limo chauffers. Etiquette is also a part of the package. 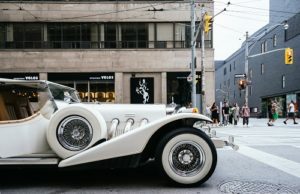 The entire idea of a limousine is to exude class and style, and having a grasp of proper etiquette is important in getting that message across. Clients expect the chauffeur to arrive on time, if not early. They have to know where to go, even if the client changes plans at the last minute. They also have to maintain a good grasp of decorum and propriety at all times. All of this must be combined with making sure the client is never late. All of this has to be done with a professional demeanour and impeccable manners. After all, the limousine is a high-class vehicle and should be paired with a high-class chauffeur.